Why Music in Early Childhood? What is the benefit of early childhood music, and why has the Joyful Noise C-Fund supported its cause with the Gift of Music Classes—a free service to children in the community? Each year, Joyful Noise C-Fund’s non-profit program reaches children who might not otherwise be able to afford early childhood music education. From local Grand Haven Head Start students to children at Holland’s Stepping Stones daycare for the homeless and transient, kids from infancy through preschool age are receiving free instruments along with fun, age-appropriate music instruction through the C-Fund’s A Gift of Music classes. But what is the benefit—besides being fun? This year, the Joyful Noise C-Fund has targeted approximately 50 young children in the Grand Haven and Holland area with the Gift of Music Program. Each child receives a free instrument coupled with three consecutive classes that explore everything from culture to music theory. The 2016 instrument theme is tambourines, and students learn how to use and care for their instruments as part of the course, before taking them home at completion. The C-Fund relies on donations from the community to fund their programs each year. Information on the program can be found at here www.CThePossibilities.org. Let your child choose the soundtrack. Put on the radio in the car, and let them decide on their favorite station. Ask them what they like about the music—point out what you hear, and ask them to do the same. Take turns making up rhymes. Ask your child to repeat patterns—rhythmic clapping, words or different sounds and pitches. Talk to your children about your music preferences—play music for them, and ask for their feedback. Gardner, H. Frames of Mind. New York: Basic Books, 1983. Harman, M. “Music and Movement - Instrumental in Language Development.” Early Childhood News. 2008. The C-Fund is the Joyful Noise Christian Childcare giving program which supports quality early childhood programs in the Grand Haven, MI and surrounding areas! 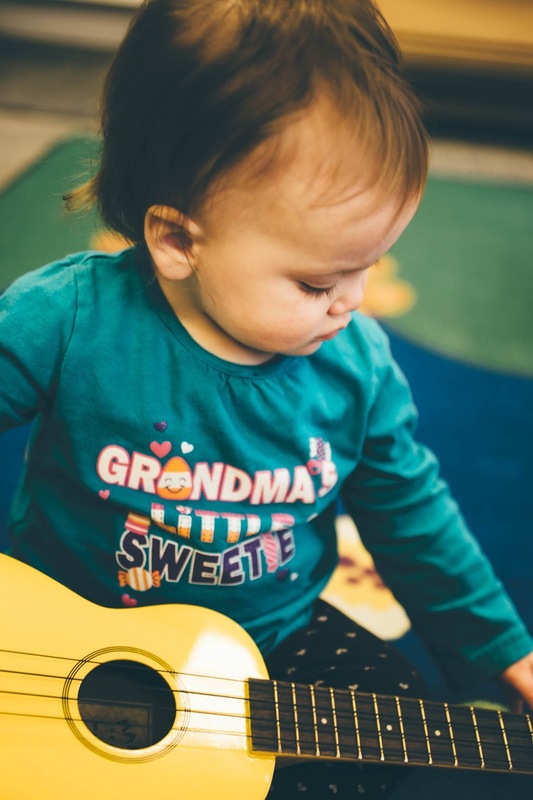 Some of the programs supported by the C-Fund are free services offered to the community, with a focus on those in need or under-served, such as the Gift of Music free early childhood music classes (offered by Joyful Noise). The C-Fund also supports the growing needs of Joyful Noise's high quality early childhood program, which offers a full day of care to infants all the way through school age children. Are you donating with a credit card? Please read these instructions and then use the link below. For a full administrative directory and map information, please view our main contact page at www.JoyfulNoiseKids.com. Please check back soon for our list of generous donors and updates on the Joyful Noise Coin wall!